This article describes the steps you take to prepare the Azure infrastructure for installing and configuring a high-availability SAP system on a Windows failover cluster by using a cluster shared disk as an option for clustering an SAP ASCS instance. Azure Resource Manager templates for SAP help simplify deployment of required resources. The three-tier templates in Azure Resource Manager also support high-availability scenarios. For example, Architectural Template 1 has two clusters. Each cluster is an SAP single point of failure for SAP ASCS/SCS and DBMS. In the Azure portal, in the Parameters pane, in the SYSTEMAVAILABILITY box, select HA. All IP addresses of the network cards and Azure internal load balancers are dynamic by default. Change them to static IP addresses. We describe how to do this later in the article. For production SAP systems, deploy Azure virtual machines with corporate network connectivity (cross-premises) by using Azure VPN Gateway or Azure ExpressRoute. You can use your Azure Virtual Network instance. The virtual network and subnet have already been created and prepared. In the Azure portal, in the Parameters pane, in the NEWOREXISTINGSUBNET box, select existing. In the SUBNETID box, add the full string of your prepared Azure network subnet ID where you plan to deploy your Azure virtual machines. The ID field shows the value for the subnet ID. You can deploy your high-availability SAP system in a cloud-only deployment model. This kind of deployment primarily is useful for demo and test use cases. It's not suited for production use cases. In the Azure portal, in the Parameters pane, in the NEWOREXISTINGSUBNET box, select new. Leave the SUBNETID field empty. The SAP Azure Resource Manager template automatically creates the Azure virtual network and subnet. You also need to deploy at least one dedicated virtual machine for Active Directory and DNS service in the same Azure Virtual Network instance. The template doesn't create these virtual machines. 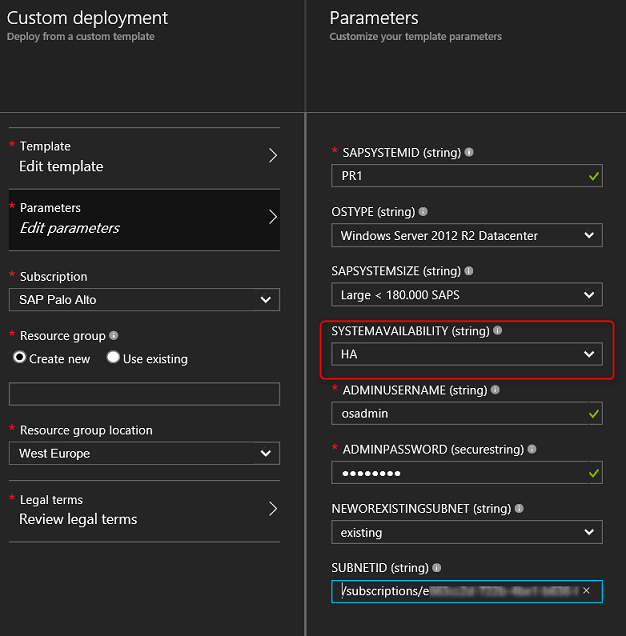 You can use this Azure Resource Manager template for SAP to help simplify the deployment of required infrastructure resources for SAP Architectural Template 2. You can prepare the infrastructure and configure SAP for multi-SID. For example, you can add an additional SAP ASCS/SCS instance into an existing cluster configuration. For more information, see Configure an additional SAP ASCS/SCS instance for an existing cluster configuration to create an SAP multi-SID configuration in Azure Resource Manager. If you want to create a new multi-SID cluster, you can use the multi-SID quickstart templates on GitHub. The following sections have more details about the templates and parameters that you need to provide in the templates. 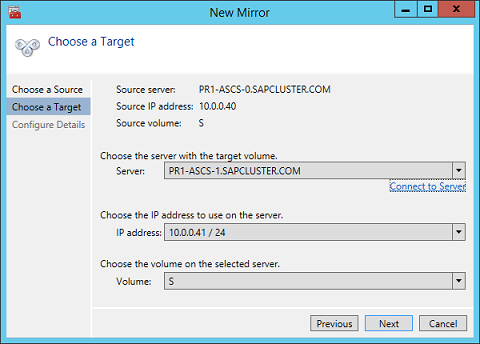 The ASCS/SCS template deploys two virtual machines that you can use to create a Windows Server failover cluster that hosts multiple ASCS/SCS instances. Resource Prefix: Set the resource prefix, which is used to prefix all resources that are created during the deployment. Because the resources do not belong to only one SAP system, the prefix of the resource is not the SID of one SAP system. The prefix must be between three and six characters. Stack Type: Select the stack type of the SAP system. Depending on the stack type, Azure Load Balancer has one (ABAP or Java only) or two (ABAP+Java) private IP addresses per SAP system. OS Type: Select the operating system of the virtual machines. SAP System Count: Select the number of SAP systems that you want to install in this cluster. Admin Username and Admin Password: Create a new user that can be used to sign in to the machine. New Or Existing Subnet: Set whether to create a new virtual network and subnet or use an existing subnet. If you already have a virtual network that is connected to your on-premises network, select existing. The load balancer contains 1 VIP(s) (2 for Linux), 1x VIP for ASCS/SCS, and 1x VIP for ERS (Linux only). The database template deploys one or two virtual machines that you can use to install the relational database management system (RDBMS) for one SAP system. For example, if you deploy an ASCS/SCS template for five SAP systems, you need to deploy this template five times. Sap System Id: Enter the SAP system ID of the SAP system that you want to install. The ID is used as a prefix for the resources that are deployed. SQL: The load balancer load-balance port 1433. Make sure to use this port for your SQL Server AlwaysOn setup. HANA: The load balancer load-balance ports 35015 and 35017. Make sure to install SAP HANA with instance number 50. The load balancer uses probe port 62550. Sap System Size: Set the number of SAPS the new system provides. If you are not sure how many SAPS the system requires, ask your SAP Technology Partner or System Integrator. Subnet Id: Enter the ID of the subnet that you used during the deployment of the ASCS/SCS template, or the ID of the subnet that was created as part of the ASCS/SCS template deployment. The application servers template deploys two or more virtual machines that can be used as SAP Application Server instances for one SAP system. For example, if you deploy an ASCS/SCS template for five SAP systems, you need to deploy this template five times. Sap System Size: The number of SAPS the new system provides. If you are not sure how many SAPS the system requires, ask your SAP Technology Partner or System Integrator. 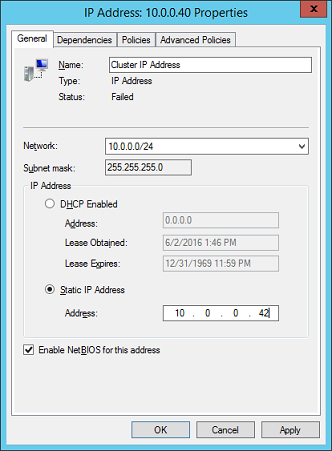 In our example, the address space of the Azure Virtual Network instance is 10.0.0.0/16. There is one subnet called Subnet, with an address range of 10.0.0.0/24. All virtual machines and internal load balancers are deployed in this virtual network. Don't make any changes to the network settings inside the guest operating system. This includes IP addresses, DNS servers, and subnet. Configure all your network settings in Azure. The Dynamic Host Configuration Protocol (DHCP) service propagates your settings. In the Azure portal, in the DNS servers pane, make sure that your virtual network DNS servers option is set to Custom DNS. Corporate network connectivity (cross-premises): Add the IP addresses of the on-premises DNS servers. You can extend on-premises DNS servers to the virtual machines that are running in Azure. In that scenario, you can add the IP addresses of the Azure virtual machines on which you run the DNS service. 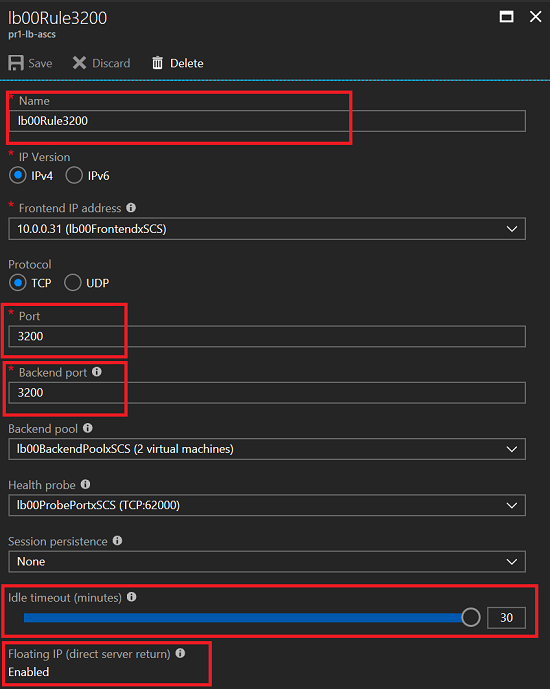 For VM deployments which are isolated in Azure: Deploy an additional virtual machine in the same Virtual Network instance that serves as a DNS server. 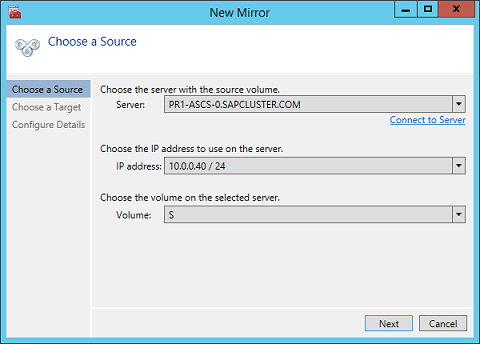 Add the IP addresses of the Azure virtual machines that you've set up to run the DNS service. If you change the IP addresses of the DNS servers, you need to restart the Azure virtual machines to apply the change and propagate the new DNS servers. When you create the cluster, create the virtual host names pr1-ascs-vir and pr1-dbms-vir and the associated IP addresses that manage the cluster itself. 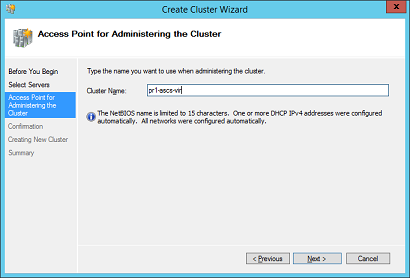 For information about how to do this, see Collect cluster nodes in a cluster configuration. You can manually create the other two virtual host names, pr1-ascs-sap and pr1-dbms-sap, and the associated IP addresses, on the DNS server. The clustered SAP ASCS/SCS instance and the clustered DBMS instance use these resources. For information about how to do this, see Create a virtual host name for a clustered SAP ASCS/SCS instance. After you deploy the virtual machines to use in your cluster, you need to set static IP addresses for all virtual machines. Do this in the Azure Virtual Network configuration, and not in the guest operating system. 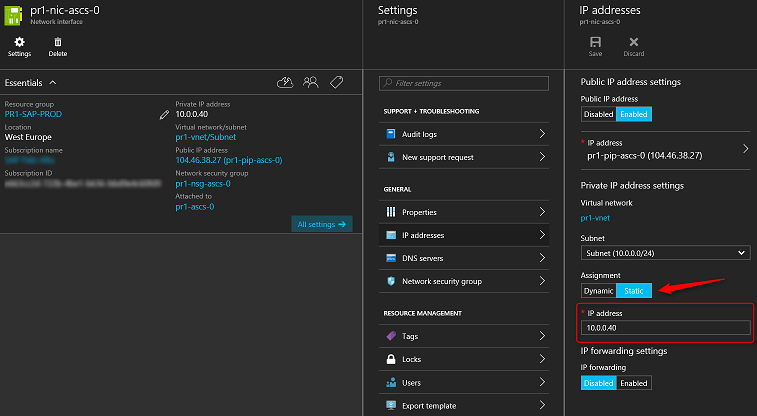 In the Azure portal, select Resource Group > Network Card > Settings > IP Address. In the IP addresses pane, under Assignment, select Static. In the IP address box, enter the IP address that you want to use. 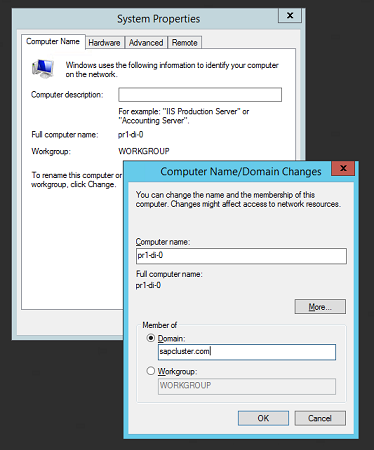 If you change the IP address of the network card, you need to restart the Azure virtual machines to apply the change. Repeat this step for all network interfaces, that is, for all virtual machines, including virtual machines that you want to use for your Active Directory or DNS service. The SAP Azure Resource Manager template creates an Azure internal load balancer that is used for the SAP ASCS/SCS instance cluster and the DBMS cluster. The IP address of the virtual host name of the SAP ASCS/SCS is the same as the IP address of the SAP ASCS/SCS internal load balancer: pr1-lb-ascs. The IP address of the virtual name of the DBMS is the same as the IP address of the DBMS internal load balancer: pr1-lb-dbms. The initial deployment sets the internal load balancer IP address to Dynamic. In the Azure portal, on the IP addresses pane, under Assignment, select Static. Set the IP address of the internal load balancer pr1-lb-ascs to the IP address of the virtual host name of the SAP ASCS/SCS instance. Set the IP address of the internal load balancer pr1-lb-dbms to the IP address of the virtual host name of the DBMS instance. When you install your SAP ASCS/SCS instance, you must use the default instance number 00 for your ABAP ASCS instance and the default instance number 01 for your Java SCS instance. Next, create the required internal load balancing endpoints for the SAP NetWeaver ports. Set the IP address of the load balancer pr1-lb-dbms to the IP address of the virtual host name of the DBMS instance. If you want to use different numbers for the SAP ASCS or SCS instances, you must change the names and values of their ports from default values. 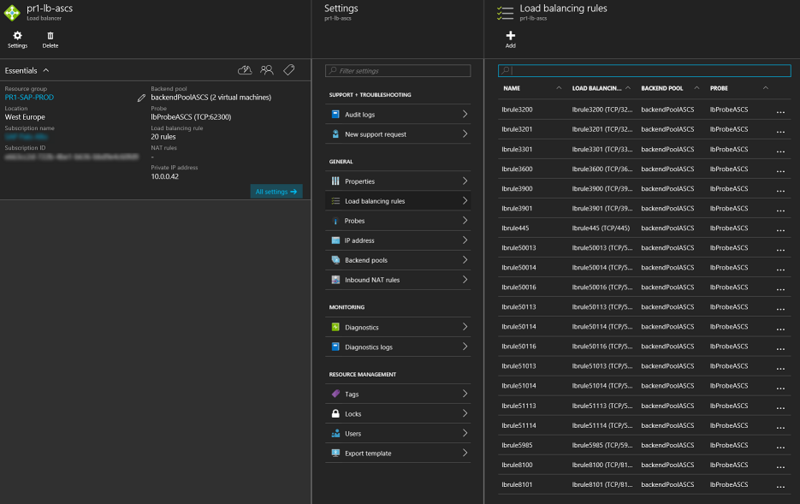 In the Azure portal, select <SID>-lb-ascs load balancer > Load Balancing Rules. For example, if you want to change the default ASCS instance number from 00 to 31, you need to make the changes for all ports listed in Table 1. Here's an example of an update for port lbrule3200. After you assign a static IP address to the virtual machines, add the virtual machines to the domain. Azure Load Balancer has an internal load balancer that closes connections when the connections are idle for a set period of time (an idle timeout). SAP work processes in dialog instances open connections to the SAP enqueue process as soon as the first enqueue/dequeue request needs to be sent. These connections usually remain established until the work process or the enqueue process restarts. However, if the connection is idle for a set period of time, the Azure internal load balancer closes the connections. This isn't a problem because the SAP work process reestablishes the connection to the enqueue process if it no longer exists. These activities are documented in the developer traces of SAP processes, but they create a large amount of extra content in those traces. It's a good idea to change the TCP/IP KeepAliveTime and KeepAliveInterval on both cluster nodes. Combine these changes in the TCP/IP parameters with SAP profile parameters, described later in the article. 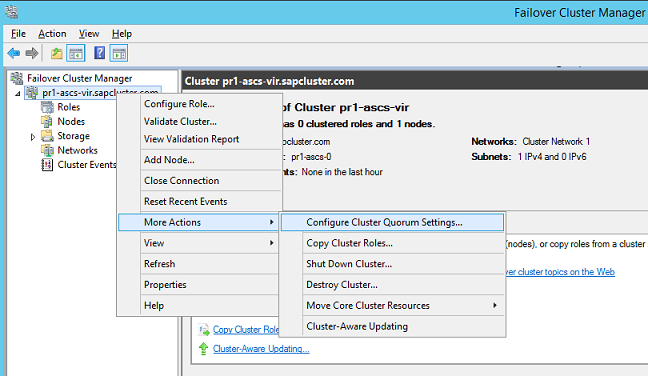 To apply the changes, restart both cluster nodes. 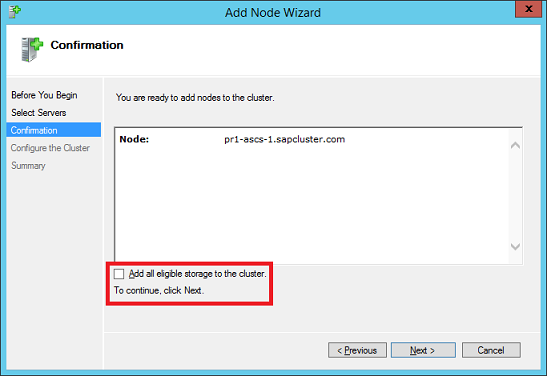 Collect the cluster nodes in a cluster configuration. Configure a cluster file share witness. 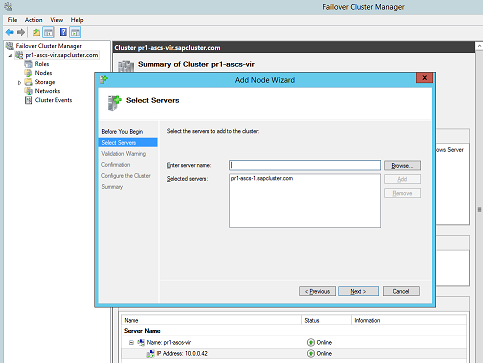 In the Add Role and Features Wizard, add failover clustering to both cluster nodes. 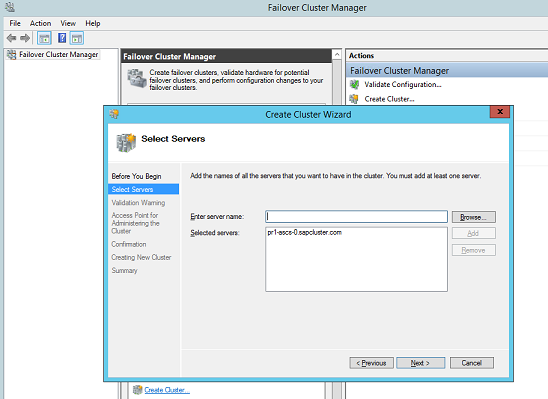 Set up the failover cluster by using Failover Cluster Manager. 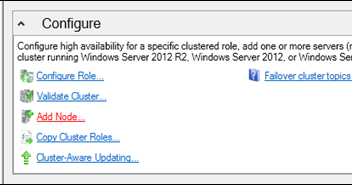 In Failover Cluster Manager, select Create Cluster, and then add only the name of the first cluster (node A). Do not add the second node yet; you add the second node in a later step. Enter the network name (virtual host name) of the cluster. 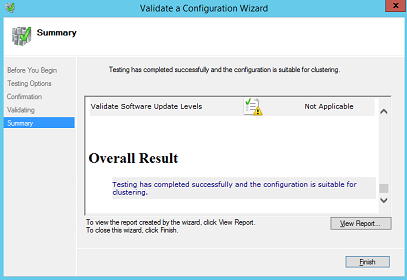 After you've created the cluster, run a cluster validation test. You can ignore any warnings about disks at this point in the process. You'll add a file share witness and the SIOS shared disks later. At this stage, you don't need to worry about having a quorum. Change the IP address of the core cluster service. The cluster can't start until you change the IP address of the core cluster service, because the IP address of the server points to one of the virtual machine nodes. Do this on the Properties page of the core cluster service's IP resource. For example, we need to assign an IP address (in our example, 10.0.0.42) for the cluster virtual host name pr1-ascs-vir. Bring the cluster virtual host name online. Add the second cluster node. Now that the core cluster service is up and running, you can add the second cluster node. Enter a name for the second cluster node host. 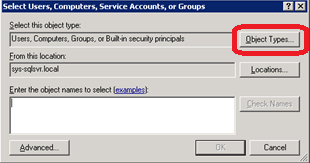 Be sure that the Add all eligible storage to the cluster check box is not selected. 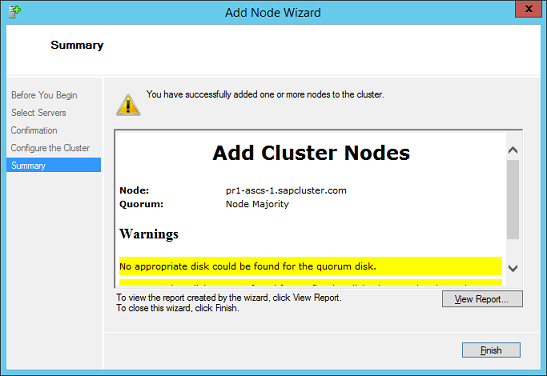 You can ignore warnings about quorum and disks. You'll set the quorum and share the disk later, as described in Install SIOS DataKeeper Cluster Edition for an SAP ASCS/SCS cluster share disk. 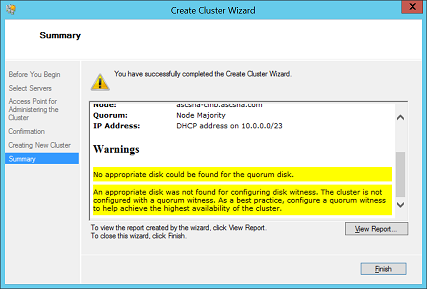 Set the file share witness quorum in Failover Cluster Manager. 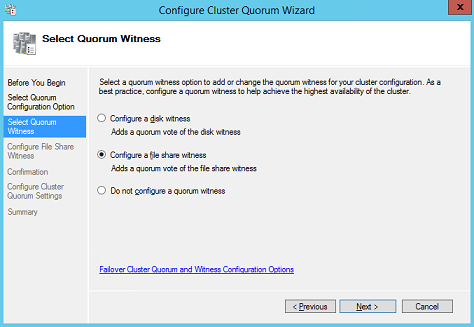 Select a file share witness instead of a quorum disk. SIOS DataKeeper supports this option. In the examples in this article, the file share witness is on the Active Directory or DNS server that is running in Azure. The file share witness is called domcontr-0. Because you would have configured a VPN connection to Azure (via VPN Gateway or Azure ExpressRoute), your Active Directory or DNS service is on-premises and isn't suitable to run a file share witness. If your Active Directory or DNS service runs only on-premises, don't configure your file share witness on the Active Directory or DNS Windows operating system that is running on-premises. Network latency between cluster nodes running in Azure and Active Directory or DNS on-premises might be too large and cause connectivity issues. Be sure to configure the file share witness on an Azure virtual machine that is running close to the cluster node. The quorum drive needs at least 1,024 MB of free space. We recommend 2,048 MB of free space for the quorum drive. Add the cluster name object. Be sure that the permissions include the authority to change data in the share for the cluster name object (in our example, pr1-ascs-vir$). 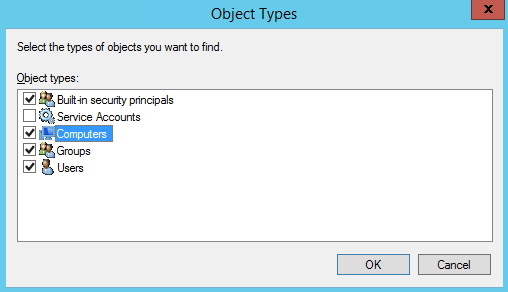 To add the cluster name object to the list, select Add. Change the filter to check for computer objects, in addition to those shown in Figure 22. Enter the cluster name object as shown in Figure 21. Because the record has already been created, you can change the permissions, as shown in Figure 20. Select the Security tab of the share, and then set more detailed permissions for the cluster name object. 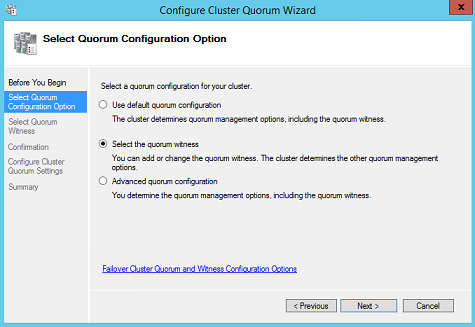 Open the Configure Quorum Setting Wizard. 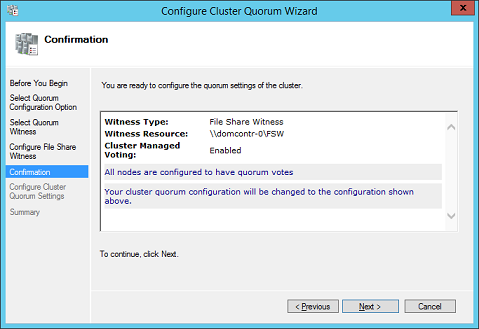 On the Select Quorum Configuration Option page, select Select the quorum witness. 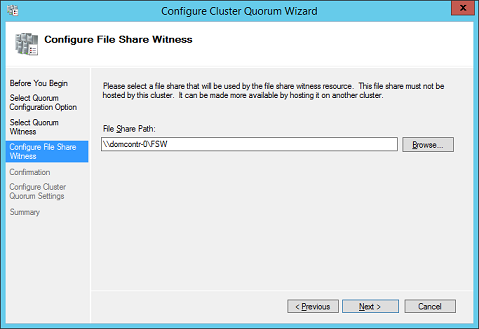 On the Select Quorum Witness page, select Configure a file share witness. Enter the UNC path to the file share (in our example, \domcontr-0\FSW). To see a list of the changes you can make, select Next. These settings were tested with customers, and offer a good compromise. They are resilient enough, but they also provide failover that is fast enough in real error conditions on an SAP software or in a node or VM failure. You now have a working Windows Server failover clustering configuration in Azure. To install an SAP ASCS/SCS instance, you need a shared disk resource. You cannot create the shared disk resources you need in Azure. SIOS DataKeeper Cluster Edition is a third-party solution that you can use to create shared disk resources. 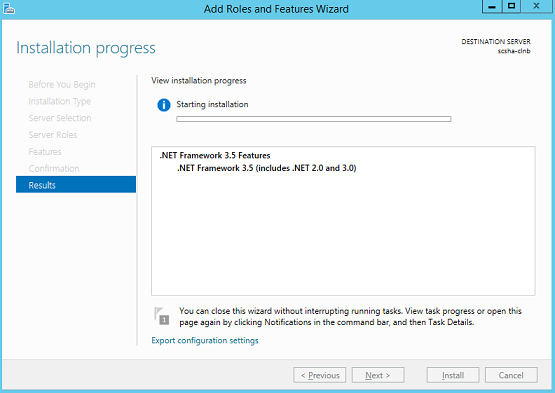 Add Microsoft .NET Framework 3.5. 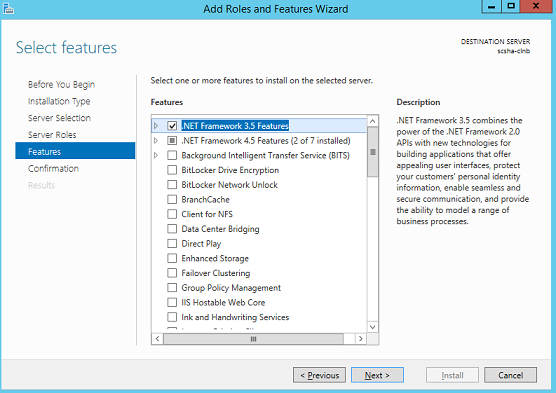 .NET Framework 3.5 isn't automatically activated or installed on Windows Server 2012 R2. Because SIOS DataKeeper requires .NET to be on all nodes where you install DataKeeper, you must install .NET Framework 3.5 on the guest operating system of all virtual machines in the cluster. 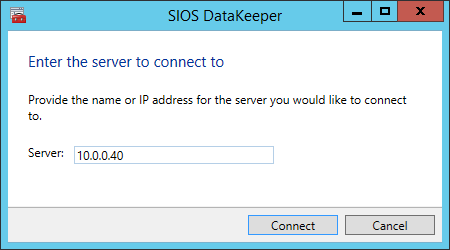 Install SIOS DataKeeper Cluster Edition on each node in the cluster. 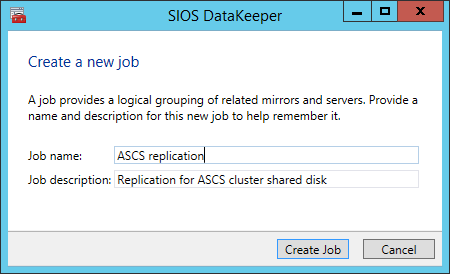 To create virtual shared storage with SIOS DataKeeper, create a synced mirror and then simulate cluster shared storage. 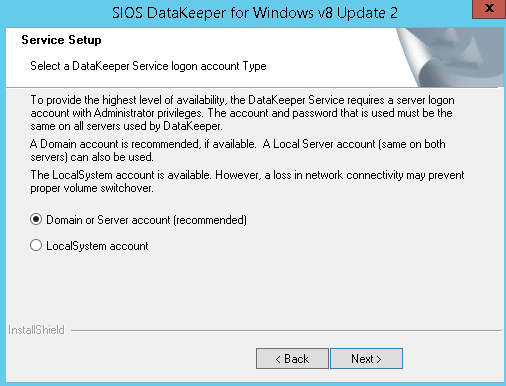 Before you install the SIOS software, create the DataKeeperSvc domain user. 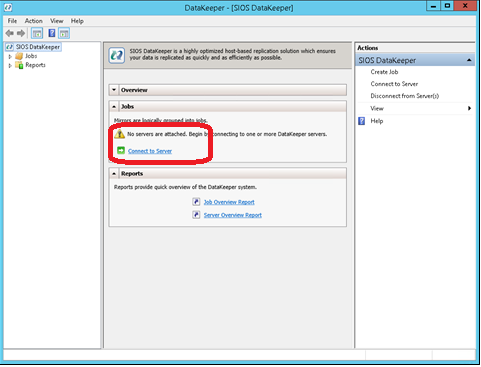 Add the DataKeeperSvc domain user to the Local Administrator group on both cluster nodes. Install the SIOS software on both cluster nodes. In the dialog box, select Yes. In the dialog box, we recommend that you select Domain or Server account. 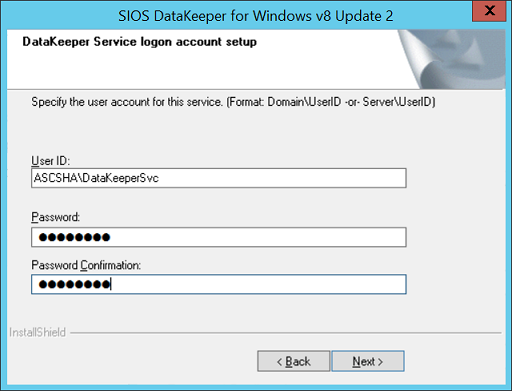 Enter the domain account user name and password that you created for SIOS DataKeeper. 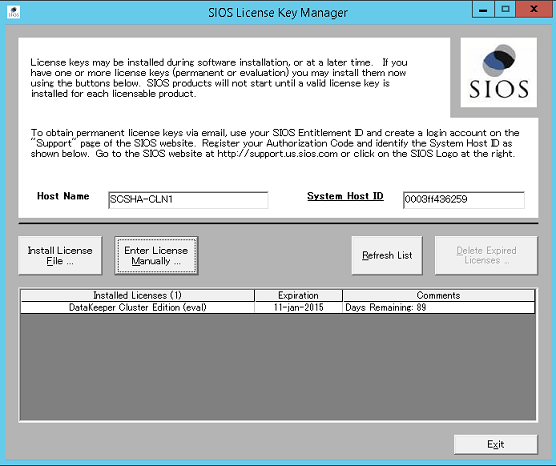 Install the license key for your SIOS DataKeeper instance, as shown in Figure 35. When prompted, restart the virtual machine. 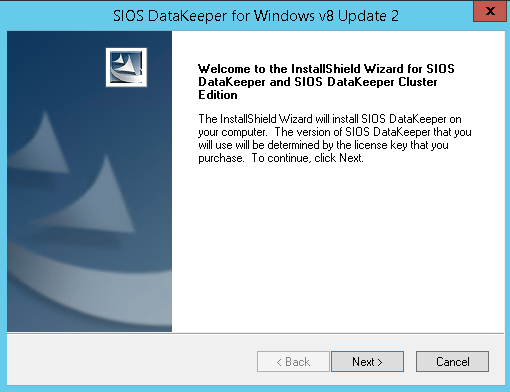 After you install SIOS DataKeeper on both nodes, start the configuration. The goal of the configuration is to have synchronous data replication between the additional disks that are attached to each of the virtual machines. 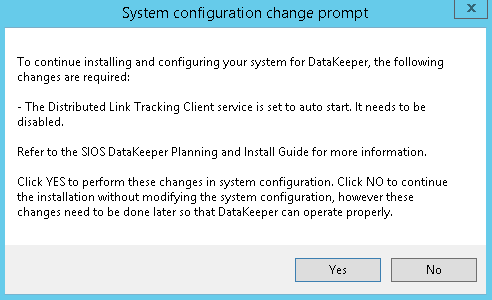 Start the DataKeeper Management and Configuration tool, and then select Connect Server. Enter the name or TCP/IP address of the first node the Management and Configuration tool should connect to, and, in a second step, the second node. Create the replication job between the two nodes. A wizard guides you through the process of creating a replication job. Define the name of the replication job. Define the name, TCP/IP address, and disk volume of the target node. Define the compression algorithms. In our example, we recommend that you compress the replication stream. Especially in resynchronization situations, the compression of the replication stream dramatically reduces resynchronization time. Compression uses the CPU and RAM resources of a virtual machine. As the compression rate increases, so does the volume of CPU resources that are used. You can adjust this setting later. Another setting you need to check is whether the replication occurs asynchronously or synchronously. When you protect SAP ASCS/SCS configurations, you must use synchronous replication. Define whether the volume that is replicated by the replication job should be represented to a Windows Server failover cluster configuration as a shared disk. 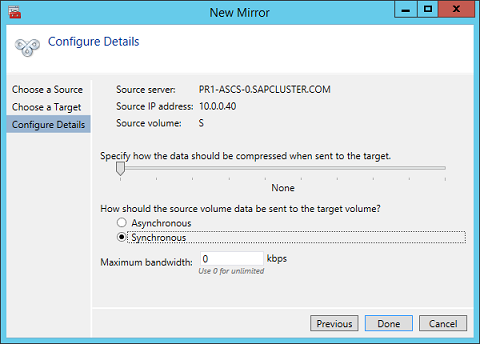 For the SAP ASCS/SCS configuration, select Yes so that the Windows cluster sees the replicated volume as a shared disk that it can use as a cluster volume. After the volume is created, the DataKeeper Management and Configuration tool shows that the replication job is active.